A print version of this book is available. Please see ISBN #9781930524088. This revised version includes updated information on IMRT and information on IGRT. 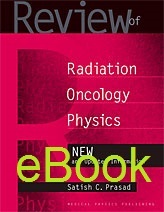 A chapter on radiation protection has also been added. This book is a resource for comprehensive study in therapeutic radiological physics and was designed primarily to help radiation oncology residents and radiation therapists study for the radiological physics portion of the board and registry examinations. It will also be helpful to dosimetrists who are preparing for board certification. It assumes a background in radiation oncology physics and is not intended to replace the standard radiation oncology physics texts. Rather, its purpose is to refresh and reinforce the basic concepts of radiation physics which residents, technologists, and dosimetrists are expected to know. Because radiation oncology has been greatly impacted by recent developments in technology and new treatment modalities, an entire chapter has been devoted to some of the new modalities. At the end of the book, sample questions have been provided so that readers can self test their knowledge. Answers to review questions are also included.